Summer will be winding down soon and hopefully we'll see cooler temperatures and the end of the smoke! Along with the change in seasons, September signals the settling back into routine schedules after summer travels and kids heading back to school. (Yes, we can hear the collective sigh from parents everywhere...not so much from teachers). It's also the time to get back into your fitness routine. Why not do that with a friend? It's always more fun to work out with a buddy plus it's easier to be consistent. So, we'd like to offer you the opportunity to invite your local friends and family members to be your guests for the entire month of September at no cost! Yes, you read that correctly...for the whole month...free! What's the catch? There isn't any. No cost. No obligation. No kidding. Who do you know who would benefit from increased fitness, greater health and energy and of course, more fun? It's easy: just fill out and give the guest gift certificate (below) to your friend(s) and invite them to join you. But hurry, you know how fast a month goes by and this offer is good only for the month of September. As always, we are here to assist you and your guests. If you need additional certificates or have any questions, please ask one of the Thrive trainers. 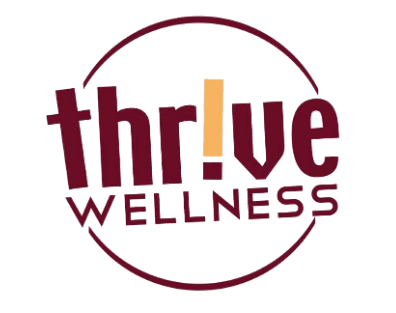 Don't keep Thrive Wellness all to yourself. Help your friends live happily ever active, too!